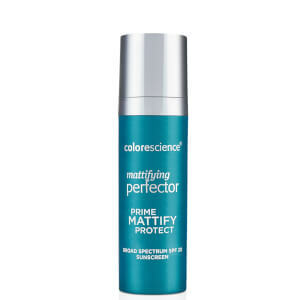 Colorescience Skin Perfector Brightening Primer SPF 20 instantly reduces redness, pores, shine, as well as fine lines and wrinkles. The silky texture matches your skin, giving the appearance of a naturally flawless face. It contains a natural SPF of 20 to protect from sun damage. Formerly known as Line Tamer. Ideal for those with aging skin or large pores who want an even, smooth, bright complexion with or without added makeup. Blend on the face, neck and hands to use as a primer. Pat it under or over makeup, anywhere you want a smooth, velvety finish. Use on lines, pores, or rough, red, peeling skin. Love this product. It made my makeup feel smooth and flawless, not flaky. Love this product. Have been using this for years. Great base before applying foundation. Helps makeup stay in place all day. Great sunscreen! I have been using Colorscience sunscreen for years and love it so wondered what the primer would do for me. I am now on my 3rd order. 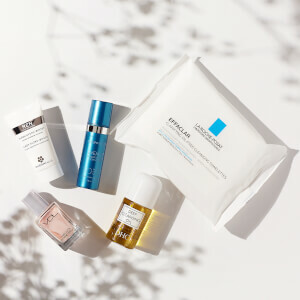 You must put on moisturizer first, as directed, and then the primer glides smoothly over the skin leaving it smooth, brighter with reduced lines and flaws, too. And of course there is the sunscreen protection. So what is not to love? I did not give this a five because the product is very thick. You just put a dab on your face and it doesn't spread too easily. So, if you put fresh moisturizer on your face then it will spread without having to stretch your skin smearing it. It is a very good base for makeup and absolutely does hide flaws, making your skin very smooth. I also have put a dab in my palm, and mixed moisturizer with it to make it easier to put on. Then you can put your makeup over that. This is a base (not to be mixed with makeup) and will make your makeup look flawless. I needed a primer and just randomly picked this one. I figure if I hated it, I'd send it back, but I love it and will buy more. My skin looks amazing. Glowing and smooth! I just had some skin peels and want to keep my skin protected. I'm in sunny CA and the SPF in the product makes it an added bonus. My Derm has the Mineral sunscreen brush and that's how I was introduced to this brand. I was introduced to this line by my esthetician. I started with Wild to Mild and decided to give this a try. I love how silky and smooth it is. It definitely gives a nice glow and softens the skin. It doesn't give any specific coverage but I like that I know I have extra SPF on after my moisturizer. Randomly purchased this primer and my makeup looks amazing. I'm so happy I found another spf layer for my face. It does exactly what it says: shines, brightens, silky, protects without caking. Will buy and tell my friends. I just had a set of skin peels and need as much spf as possible. I love this stuff! It's good for lines, pores, redness, and has sunscreen in it. This is a fabulous product cover flaws and evens the whole skin, covers large pores and redness. I am 57 and this is a remarkable product. It also helps to soften dark circles and fine lines around the eye area. I use it every day and sometimes with only blush and Mascara with an SPF of 20. Thank You don't ever phase this product out please.